The Hjelle Jar ~ My first time seeing a Cedar Waxwing! 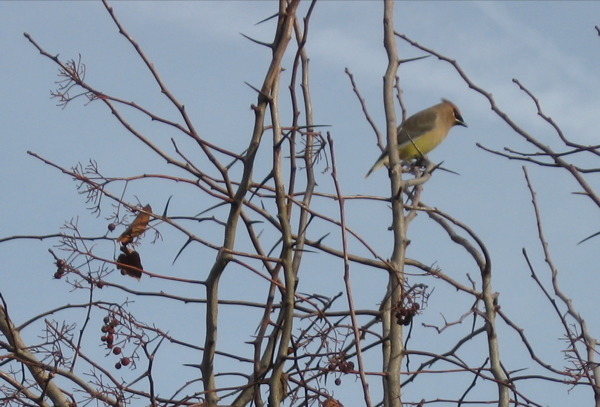 My first time seeing a Cedar Waxwing! I love it when I learn about a new bird, or see a bird I have never seen before. On my way home this morning I saw a flock of waxwings which was new for me. I was so excited I went back with my camera to see if I could get a picture. God was good and I was able to! I have always loved the colouring on this bird, at least in the pictures I have seen of them, so it was even more exciting to finally see them in real life! Sorry the bird isn’t really clear in this picture, it’s blown up from another picture I took.